The state is situated between 22o7' and 24o2' North latitudes and 91o0' and 92o0' East longitudes with the Tropic of Cancer passing through it.The State has three distinct physiographic zones i) hill ranges ii) undulating plateau land and iii) low-lying alluvial land. 'Five major hill ranges traverse the State in roughly north-south direction and continue southward into Chittagong Hill Tract. Narrow valleys separate these ranges generally 20 km wide. The easternmost range is Jampui, being successively followed to the West by Unokoti-Sakhantlang, Longthorai, Atharamura-Kalajhari and Baramura-Deotamura. The highest peak lies at Bethliangchhip (Thaidawar, Shib-rangkhung), 975.36 m above the sea level. 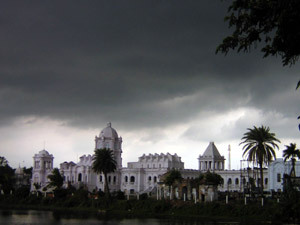 The climate of Tripura exhibits a strong seasonal rhythm. The state is characterised by a warm and humid tropical climate with five distinct seasons, namely, spring, summer, monsoon, autumn and winter.Spring starts from late mid-February & continues till midMarch. Winter returns if there is rain a fresh in mid-February. Summer season starts from middle of March and reaches its peak in April - May. Pre-monsoon rain is always experienced after Jhum harvesting in the hills in March-April. Occasionally there is hardly any gap between pre-monsoon and monsoon rain. The recorded maximum temperature is 35.60°c. The monsoon generally breaks in the later part of May or first week of June and lasts till September. Winter sets in from November and is severe in the month of January when minimum temperature recorded is 4ºc in January 1995. Humidity is generally high throughout the year. In the summer season the relative humidity is varied from 50 percent to 74 percent whereas in the rainy season it is over 85 percent. 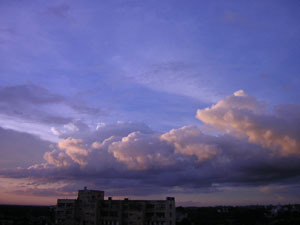 A more sensitive element of climate is the variation in rainfall. It varies not only from place to place or from year to year, but also between seasons. Annual rainfall ranges from 1922 mm to 2855 mm. The rainfall generally increases from Southwest to Northeast. There is a big gap in the rainfall content in southern and central part around Amarpur, which is surrounded by 1500 mm. Isohyets. The northeastern part of the state around Dharmanagar gets maximum rainfall. Most of the rain comes during the months April June and July to September. This period is generally referred to as the kharif season and this is the major agricultural season of the state. The State of Tripura is well endowed with surface water resources. As many as 10 (ten) major rivers in the state is reported to generate an annual flow of 793 million cubic meter of water. All rivers are rain-fed and ephemeral in nature. All major rivers originate from hill ranges they are generally ephemeral in nature and their flow is directly related to the rainfall.